In 2005 we started with raising our first pigs. Quickly we noticed that the pigs polluted the air, and the manure the water. As a reaction to this, we changed our way of holding pigs. In 2007 we expanded the pigs facilities by building new accommodation, but we did this different from conventional pig farms. Whereas the conventional farms hold their pigs in large buildings where no daylight can enter, we have our pigs in small buildings spread out over our farm with green areas between every building. Nature is highly incorporated in the pigs accommodation. To deal with the manure produced by the pigs we built a anaerobic digester 10 years ago. This digester converts manure into biogas, what can be used as cooking gas. Because of the bio-digester the water quality around the farm improved rapidly since we no longer need to dump the manure into the ponds. To get the pigs the closest to nature as possible, we started to hold free-range pigs. They live in the forests and have a broad diet of fresh food, like grass, grapes, pumpkins and grains. 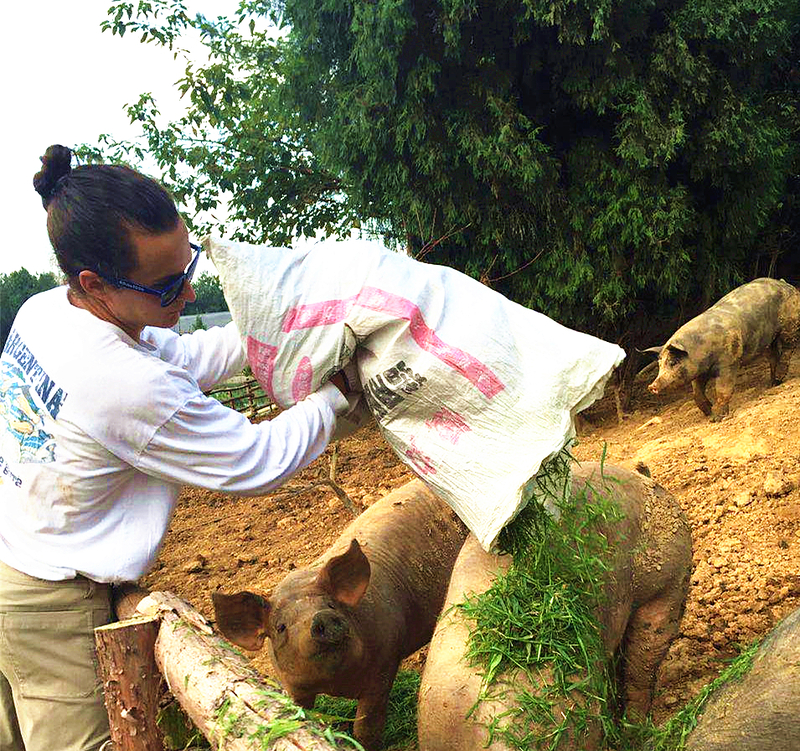 In this natural environment, the pigs exercise a lot, which keeps them healthy and creates a strong immune system. Our free-range pigs are very healthy and give us good quality meat. Chickens were introduced to the farm in 2016. All of our chickens are free range, what is the closest we can find to nature. They have a lot of trees, what creates a safe environment for them and they live together with geese, who keep predators away. Around 2000 chickens are spread over 3 areas on the farm. Different from conventional farms, we also raise the roosters for quality meat. Chickens are forest animals, the forest is safe & comfortable for them. In 2017 the goats got introduced to the farm. They have a main homestead on a mountain side and we take them out in the forest on a daily basis. The goats maintain the forest in a natural way and they produce meat in return. The goats are good at maintaining plants, what creates an ecosystem.